She was sleeping soundly, smiling in her sleep while she dreamt of chasing colourful butterflies in garden. When the persistent sun shone brightly on her face, little girl with pigtails sighed and snuggled back under the covers, blissfully embracing slumber. The mild caress of heavenly aroma coming from kitchen nudged her gently to open her heavy eyelids. Dragging her feet on cool marble floor with her favourite doll tucked under one arm and blinking her eyes to the golden glow of sunshine streaming from high ventilator and windows, she blissfully inhaled the wonderful aroma of ground coffee beans and spices. The sight of her mother with long hair tied in a loose knot adorned with pearls of water, standing in kitchen stirred the feeling of love and happiness. 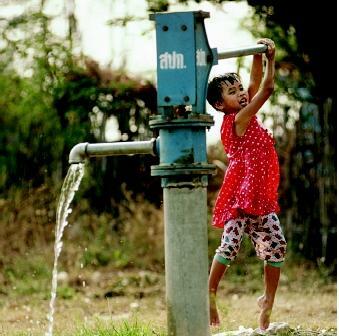 She ran and hugged her mother inhaling the heady perfume of her herbal soap and shampoo. Mother gently lifted her daughter planting kisses on her daughter’s blushed chubby cheeks and placed her away from heat, close to window where she could see the world waking up to the glorious sunshine. As her mother churned delicious food in lightening speed, little girl watched her dad entering the kitchen with special device to make one of her favourite food. As her dad and mom smiled at each other knowingly, little girl sat on the floor cross legged with a twinkle in her eyes as she watched her dad rotate the noodles presser which turned the steaming rice dough into thin, stringy white noodles. She smiled brightly at her parents looking over the food, simple home food, food that made her happy and content. Akki Shavige with Menthe/Methi Chutney and Baale Hannu Rasayana is my contribution to this month’s RCI-Karnataka hosted by our blog queen Asha of Foodie’s Hope and also to this month’s JFI-Banana hosted by lovely Mandira of Ahaar. Wash and soak rice in 2 cups of water for 4-5 hours or overnight. Drain and grind this rice with grated coconut and salt to taste adding little water at a time to very smooth paste. Note that there shouldn’t be any lumps and the paste should be silky smooth. Usually my Ajji and Amma make very thin batter of buttermilk consistency but I grind it to Dosa batter consistency which works fine for me. Apply coconut oil to heavy bottomed kadai/wok covering it well. Pour the batter in this wok and keep mixing this batter in medium flame till all the water evaporates and it turns to a thick lump of dough. Switch off the gas and start making big lemon sized balls by applying little cold water to stop it from sticking to your hand. Steam cook these rice balls in a steamer or pressure cooker without putting its weight for about 10 minutes. Place two steaming rice balls in Shavige presser or Chakkli maker and press the noodles. Place these noodles in a banana leaf or wet cloth and let it cool. This noodle needs to be cooled down to hold their shape. Serve these noodles with Chutney, sweetened Coconut Milk or Sambar. You can also make Tamarind or Lemon Rice Noodles with the leftovers. 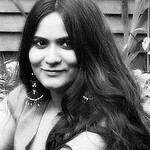 Check Shilpa or Aayi's Recipes and Manjula of Dalitoy's recipes for Shavige where they use Shavige Press here and here. And also check here for Viji of Vcuisine's recipe for Vella, Lemon and Ulundhu Sevai using Chakkli Press. My Ajji and Amma usually served Akki Shavige with Sweetened Coconut Milk or Rasayana and Menthe Chutney. 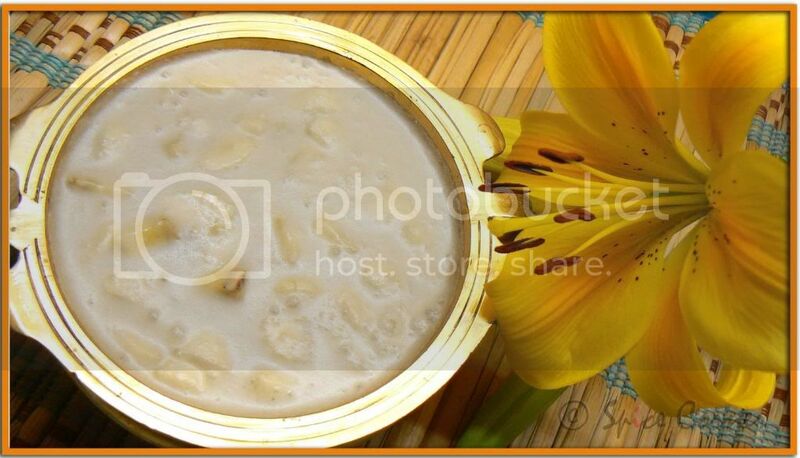 Rasayana (Rasa means Juice/essence/flavour/taste in Sanskrit) is basically a sweetened coconut milk mixed with chopped Bananas or Mangoes depending on seasonal availability of fruits. Freshly extracted Coconut milk is flavoured with Jaggery and pinch of Cardamom and made wholesome by adding chopped bananas or mangoes. Dissolve grated Jaggery in coconut milk and mix all the ingredients. Serve cold with Akki Shavige or drink as it is. You can use ripe sweet mango in place of bananas. Replace coconut milk with milk and add 2-3 tbsp of banana or mango puree to give it thick base. Methi/Fenugreek seeds are one of the most importance spices in Mangalorean cuisine. My Ajji would soak few methi seeds in buttermilk and make us drink after heavy meals as methi is good for digestion. Read more about benefits of Methi here and here. Menthe Chutney is one dish which is full of different flavours. Bitter methi is ground with creamy coconut and spicy chilli and then cooked with dash of jaggery to give it little sweet flavour. Dry roast methi and broken red chillies in a pan for around 1 minute till you get nice aroma of roasted methi. Grind sautéed spices with coconut adding little water at a time to smooth paste. Heat oil in a pan and add mustard, hing and curry leaves. Once mustard starts to pop and sputter, add ground paste, jaggery, salt to taste and ½ cup of water. Cook it on a low flame for 10-15 minutes stirring in between. 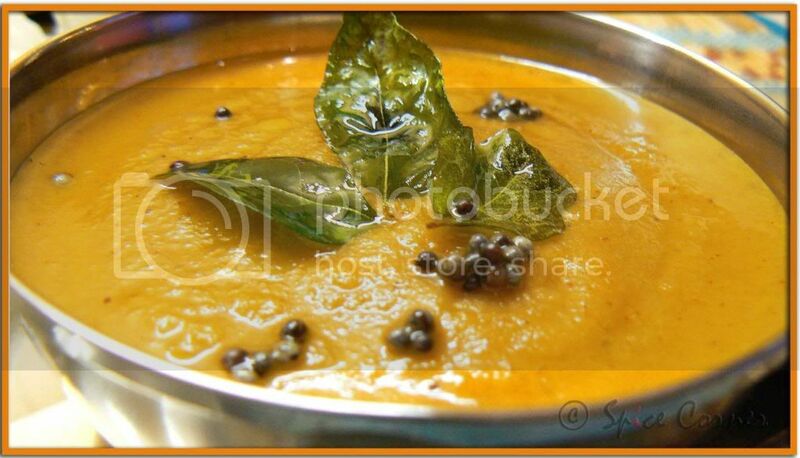 Serve hot with steamed rice or akki shavige. Sia what a fabulous entry. Akki sevige looks so pure white. Menthey chutney is so delicious, I have to try it. Rasayana looks yum yum. Sia I am totally in love with your recipe for RCI, great entry and lotsa of hard work also is involved in it. I liked the way you wrote it...but in that menthe chutney you said 1 cup of coconut seeds, I guess thats typing mistake...I am assuming it is grated coconut, right! Thanks again.Hugs.I am posting a B & W photo of formerly blind me ,at Aroma shortly! HeHe! Shavige looks good, Sia. I so identify with that girl you describe, that could be me, especially waking up to the smell of coffee. I have always loved coffee. We call this Shevai. We had the traditional one growing up. Now, I make this in the chakli press. Still god and my kids love watching me press them through the moulds. Some things don't change. Forgot to add, we serve it with rasayana , too. The menthe chutney is new to me. will try it out soon! Sia, that looks absolutely divine. I love sevai too and thanks for the detailed recipe. I get by with the frozen ones mostly. Are you a writer too? I just love the way you tell your stories in your posts. I love idiyappam but have never made it myself; the process is too elaborate for me.So who helped you make your idiyappam? You make your own coconut milk too??? I wish you had those emoticons here. I don't even know what to say! Is that tomato juice in that glass there? I love that thali of yours. I have never heard of methi chutney before. Yours looks great! hmmmm... what a wonderful breakfast and story:) oh i miss my mom's sevai made from the wooden press. It does taste so different. it's so great to see these traditional recipes, sia. you could send the rasayana to mandira for JFI. Sevei(as I call it) looks superb. My favorite combo is sevei and mango pickle with generous pour of coconut oil on top. Sia, this was such a lovely post! I loved the lil' story about Mom.....you really made me emotional with that one, dear! have no words to describe my feelings, each word felt so true.....I love Shavige!! and i have to try the menthe chutney too! hugs to you for this, i second Ashakka, more such posts, plz :). Sia you awakened my memories too. I used to loooove shevai with ros (coconut milk) or rasayana. This is exactly what I had planned for RCI too but your effort is sheer perfection. This is too much,boy love the akki shavige, we used to make it similar,had a different kind of equipment where my grandmon would stand on it and then like gold cute little strings would be formed.we usually made puliyogare. Sia you should seriously try writing a book, i can't wait to read what the next line would be in your post. Sia, what a fantastic entry. Love Sandavai with coconut milk, nothing can beat that. The methi chutney looks great too. I have the Sandavai press but does not get worked enough, you sure need an extra pair of heads to press it all out. Sia, Lovely entry. I love akki savige esp my MIL makes it very nicely. They are absolute yum. Excellent recipe Sia! Time consuming, but perfect! Your mom and grand mom made the batter thinner so that it is easy to press! I have made these some 20 years back with the coconut milk you have shown! later I learnt two more methods, which I'll soon share with all of you! Some times for an urgent breakfast I also use the ready made rice noodles. Lovely authentic recipe! Has inspired me to prepare soon! I LOVE semige, I have been working on my mangalore entry too and thought of semige but went another route.. more on that on my blog soon.. 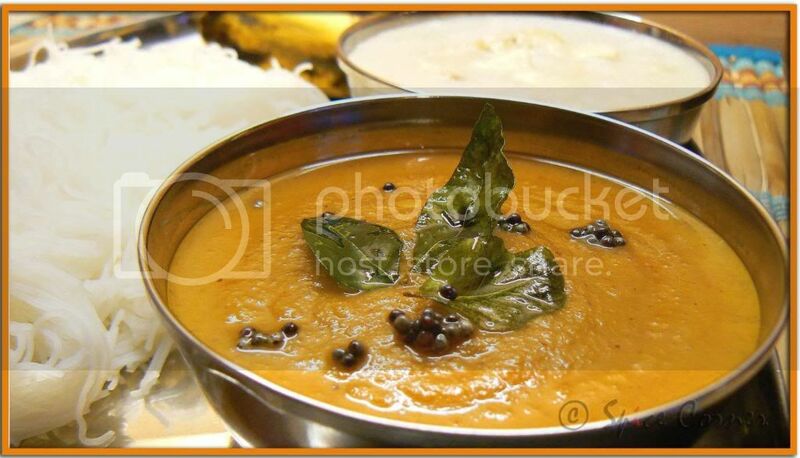 Your rasayana and chutney looks great. We usually have the coconut milk (sweet) or my mom makes semige chitranna (savory). I prefer with the rasa myself. Great recipe.. good tip on the chakli press instead of the typical semige press. hey sia.. idu nagu tumba fav.. ilov.. i was thinking of doing it this weekend.. lovely.. plate is so inviting..
thanks girl for pointing out my typo. by mistake i didn't save part of my post and had to re-write again. i am with u. now i am staying away from all pizzas n burgers and cooking very traditinal and authentic recipes. the joy of creating something like this cannot be described. thank u n welcome to spice corner. methe chutney is my ajji's recipe. do let me know ehn u try it. by the way i have planted turmeric roots in big pot. thanks for ur tip. girl stop it:) i am blushing here. for rasayana we need freshly sqeezed coconut. i have tried using canned one and just hated it. canned ones have very strange taste so i use them only when i can cook or heat them. n thats a rasberry juice.methi chutney is my granny's recipe which i absolutely love. glad u enjoyed it dear:) ur mom use wooden press? we have usual metal press at home. i never had sevai with pickle n coconut oil. will give it a try next time i make this. Nice lyrical intro and appetising food, haven't had much of an appetite these past two weeks but yours has me salivating - now I just need someone to make this for me! there is difference in cooking shavige and idiyappam. while u press noodles and then steam, we first steam the rice balls and then press noodles. drop in anytime u like girln i will make this for u. u can check any kerala or indian stores in ur area for frozen sevai. what a beautiful post sweetie! sweet words and tasty dishes, makes such a beautiful combo. want to try ur rasayana, i make a similar dish but with regular milk. menthe chutney looks yum, slurrrrp! We mallus just add hot water to rice flour and press it out. The chutney looks delicious. Your shavige looks yummy! Nevr had it wiht menthe chutney. We usually make lime semiya and a sweet podi with it. sia, you need to put a summary of your post at the end, for lazy folks like us. I also loved the recipe, could you post a pic of chakki presser ? I don't know what it is. Rasayana not only looks good, I liked the name too, it means Chemistry in Sanskrit, anything particular in Kannad ? Sia this is gorgeous. I just love shavige. Hv always eaten it with cocnut milk. yummmy !! i just feel like biting into the screen. Sia, I have always loved your food and now I'm in love with your writing. Really, I enjoyed it so much. All the dishes look yummy especially the rasayana. hey this is a nice entry.the sevige is looking good i will try this. You know how much I adore your food. sounds like a very delicious post Sia!! Never heard of methi chutney. the plate looks nice. the combinations make me hungry. the rasayana is out of this world. "Killing me softly ... (with the food)"
Shared this with Manashi (my better half) and she wants to make it - Lucky Me! and we even have the Shevayn Press! lets not discuss the coconut in the recipe - I'll just go for a long run before and after I gorge myself on this Shevayn and Ros! Well, I read the intro during my second pass and - WoW - so beautifully written. I was particularly thrilled by reference to "blushed chubby cheeks" ... . heee heeee! cute! oh yes, at home we boys were 'recruited' to do the "pressing" using the traditional press. And since we grew up in a joint family, we had a lot of dough balls to press! Thats a great entry Sia and a wonderful presentation too. We call it Idiappam and I have never prepared it myself as I thought it was too complicated to cook.my friends say it would turn out to be a bit hard..
can we make it with rice flour?? 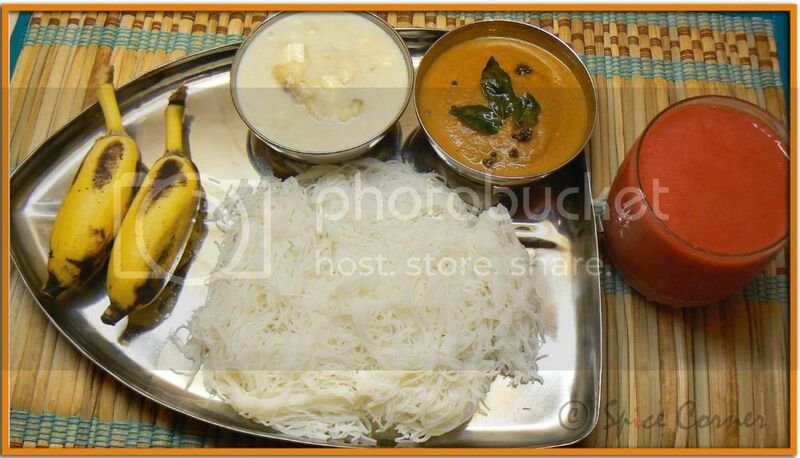 wow...your iddiyappam looks heavenly... yum... great spread!!! i like yur recipe also for iddiyappma...its different to the rice flour one i know... will give it a shot... as usual, yur pics make my mouth water!! Sia...lovely writeup...and the dishes of course are mouth watering...you have real talent taking so much pain in creating such a wonderful post.. I am Bookmarking menthey chutney recipe. 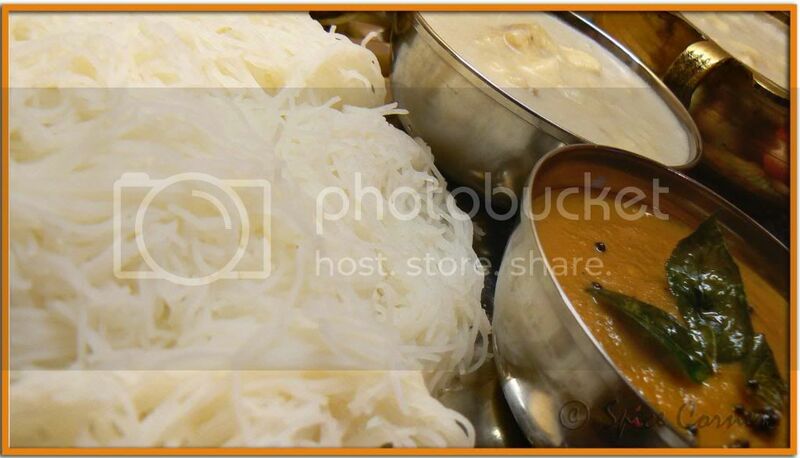 Awesome Post...In Tamil we call this dish as sevai.(Idiyappam). aawwww...wonderful post and equally lovely entries. Akki shavige looks so yum. We had Mangalorean neighbors and they used to make this shavige. I thought, shavige is dried. Also, bangalore rasayna is different than your version. What a touching introduction.... So true for most of us. Our childhood memories always but always has to do with our parents..
Akki shavige looks like Idi appam of kerala...love it ! Looks like there is some similarity in some of the dishes we make. So yummy dishes. Very nice work for rice noodles we made it as same but we use wheat flour and made wheat flour noodles and we make sweet when we use it. One thing is new you made coconut milk and add Jaggery in it we always use sugar with it. This is very creative idea of making chutney form methi seeds. Never heard about this but it’s absolutely looks delicious and also healthy too. we do use boiled rice also and that time we dont add coconut. its just plain rice shavige. u r right latha, we need to grind the batter inti very smooth paste so that when u press the noodles it will not block any holes in the container. thanks girl:) u r on a mission to post all yummies ur mom made han? u get different shaped plates in chakkli press. i used the the one which is used to make shevai for chats. do post ur recipe jyo. i know that some people use rice flour and some press noodles n then steam them. it will be nice to learn how u make sevai. being a mangalorean i cant resist coconut in any dish;) we make it with milk when we r short of time to make fresh coconut milk. yeah, there is a difference in the method used to make idiyappam and rice shavige. if i am right first the noodles is pressed and then steamed for idiyappam where as we steam rice dough and then press noodles for shavige. lucky u to have ur own shavige press:) will look forward to ur recipe dear:) pls forgive my ignorance, whi is Chitra B Divakaruni ? i have given a link to the pic of chakkli presser in my post san. anyways, here it is. u will get it for around 300/- from india. awww... i am blushing here dear:) glad u enjoyed my memories and food. menthe chutney is our family recipe, learnt it from my granny:) i am glad u liked all the dishes dear. idiyappam is bit different from shavige prema. addition of coconut makes it smooth and soft and it remains soft for long time. so for the soft noodles, use coconut while gringing rice. i did find it little hard to master in the begining. i got it lucky for the 2nd time n now i make it once in 40 days or something like that. i have never made shavige using rice flour but i have seen in different blogs where the recipe calls for rice flour. what do u mean by i have written those lines? ;) LOL... i guess the love and fondness we have for some food when growing up brings out the writer(if i may say so) hidden inside. i just have to close my eyes to feel the heat in my mom's kitchen from steamer, the smell of spices ground and the joy of watching my mom n dad churn the food i love the most:) mmm... bliss!!! thank u dear:) so did u make this for the weekend? thanks dear:) so u have tasted mangalorean shavige then? i guess the dried shavige u r talking abt is the instant ones which u use for making sevai upma and payasam. is there something called as bangalore rasayana also? now i am really interesed in knowing that. do post the recipe if u have one. thanks for the award dear:) i have posted abt it in my previous post. I know very lil about karnataka cuisine, ur blog is making me learn a lot. Every thing looks sooo delicious. gosh so many recipes and so many wonderful posts i missed when i am on holiday!! but now i am back and ready to try these wonderful dishes asap!! oiy! sia yellide? hope you are doing fine girl! Very nice blog you have here! Sia, the dish is absolutely tempting. I have not heard abt the chutney before, but plan to try it out. I want to try rasayana this time. this post is totally rocking!!! Sia- I've got to tell you that you are one of my favorite blogs - not only do you have delicious recipes, but your stories and so beautiful! thanks my dear:) u can use mango in place of banana when making rasayana. Great to see 95 comments for this post. Your way of expression and inputs from everyone who participated in the comments made this post worth reading. By the way, we have developed an innovative Automatic Sevai Cooker, called the SevaiMagik. Please visit www.sevaimagic.com for more info. I loved the way the everything looks. Just wanted to eat it :) . Are you from Mangalore, btw ?